Kota Kinabalu: Young local architects have been urged to think out of the box and come up with creative and innovative designs that are environmentally sustainable. Making the call, Chief Minister Datuk Seri Musa Aman said the role of architects in shaping cities and towns in Sabah is an important contribution to the State and its people. “Architecture is an expression of a society’s culture and over the past 50 years, many of us have benefited from the designs of good buildings and spaces that allow us to live, work and play with ease and better efficiency than before. “Today we live in a world that celebrates innovation and there are so many innovative ways to create buildings that harness natural light and the efficient use of water, including rain, to ensure that we do not end up using more energy and water. “This is the direction we should be heading towards when we talk about going green and conserving Sabah’s natural resources,” he said at the launching of a book entitled ‘Celebrating 50 Years of Architecture in Sabah’ at a hotel here, Thursday. Deputy Chief Minister Datuk Seri Raymond Tan delivered Musa’s speech at the event. “The Chief Minister does not want buildings like square boxes looking like hospitals. Even hospital designs now look different. “Buildings are an important part of our daily lives. Buildings and towns help to shape our lives in many significant ways. Buildings also express our social values and aspirations, and provide one of the primary ways by which we can visualise ourselves and our society. 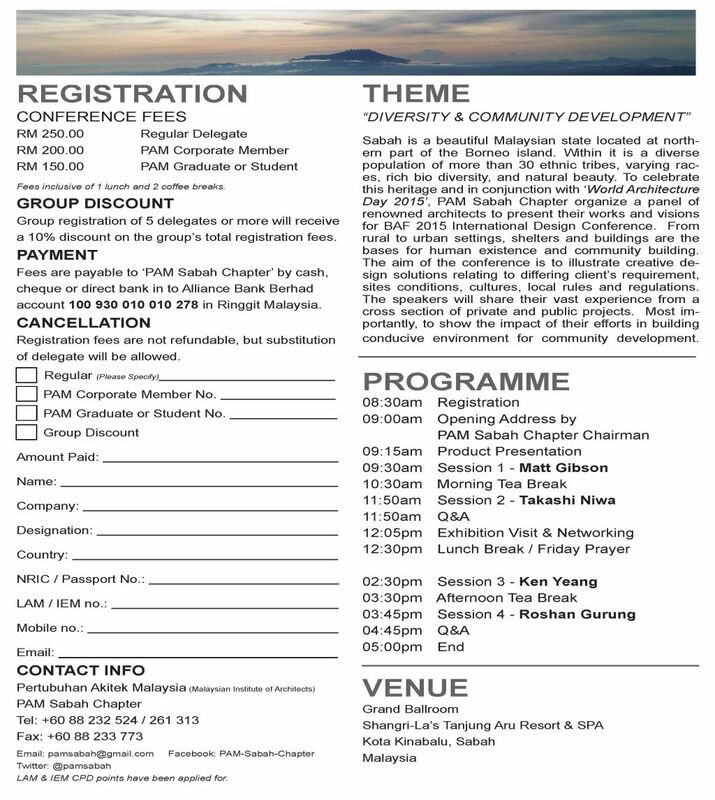 “Two years ago, Sabah celebrated 50 years of independence and our decision to become part of the Malaysian Federation. “Over the past 50 years, many of us have benefitted from the designs of good buildings and spaces that allow us to live, work and play with ease and better efficiency than before. Musa said innovation can even be brought into housing and thus the young minds can find ways to design or create homes that are affordable and environmentally sustainable. “I am confident that there is a lot of research in our universities that could make these innovations possible,” he said. On the book launching, Musa said it provides the people with a historical timeline for modern buildings in Sabah and also a visual narrative to important events that had shaped Sabah over the last half a century. But, more importantly, he said the knowledge of buildings in Sabah featured in the book will be a way for Sabahans to study the State’s history and also to develop a deeper sense of appreciation for the local architectural profession and its contributions to the State. “I would like to congratulate PAM Sabah Chapter for its successful publication of the book. I do hope it will inspire more school leavers or those still contemplating what to take up at tertiary level to consider architecture. “This adds another feather to your cap as you continue to chart pathways geared towards excellence,” Musa said. Ar. 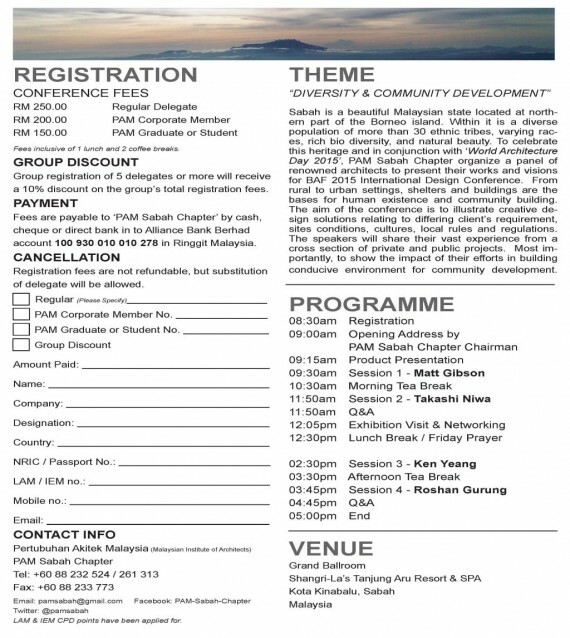 Jebb Liew, Chairman of PAM Sabah Chapter, believes that Kota Kinabalu has what it takes to hold international events and urged architects, engineers, housing developers, government officials, building contractors, graduates and students as well as the public who are interested in creative designs to attend the International Design Conference Friday at the Shangri-La Tanjung Aru Resort ballroom. Liew hopes that it will put Sabah on the world’s map when the Borneo Architecture Festival becomes a regional or international event in future. Meanwhile, Tan called on architects to design iconic buildings that will last hundred years like some historical buildings in London or Paris. He spoke on the Agnes Keith House at length which is drawing tourists to Sandakan as is the more than a 100 years old church there, all worthy of heritage conservation, although not every old building should or could be preserved. 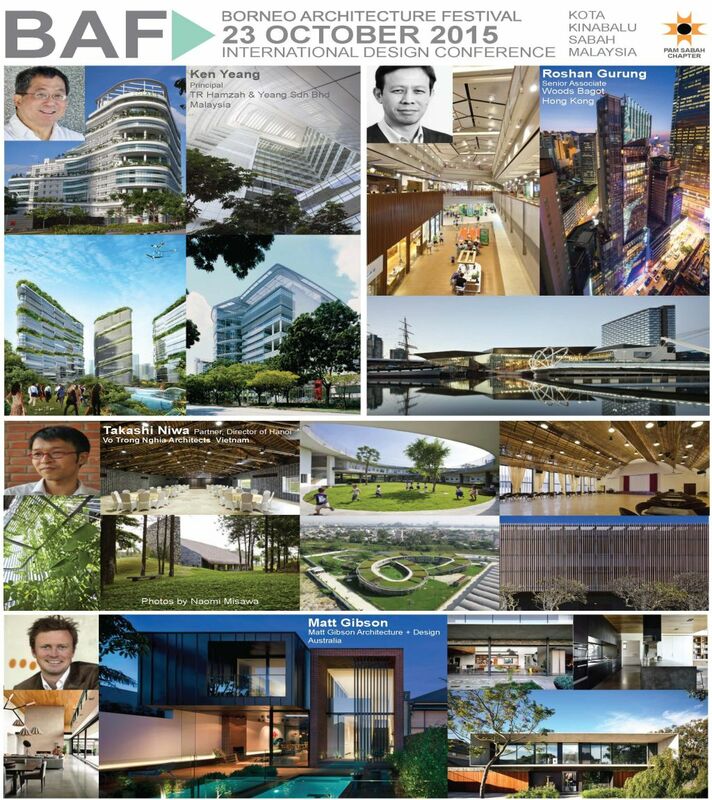 He said it was opportune for architects to share ideas at important meetings like the International Design Conference during the Borneo Architecture Festival among themselves and other professionals, including the Mayor and other government officials who should be invited to attend, as they vet and approve development plans. Also present were Malaysia Architect Association (PAM) Sabah Chapter Chairman, Jebb Liew, chairman of the book launching, Victor Wong, Organising Chairman of Borneo Architecture Festival International Design Conference, Michael Wong, and other officials. 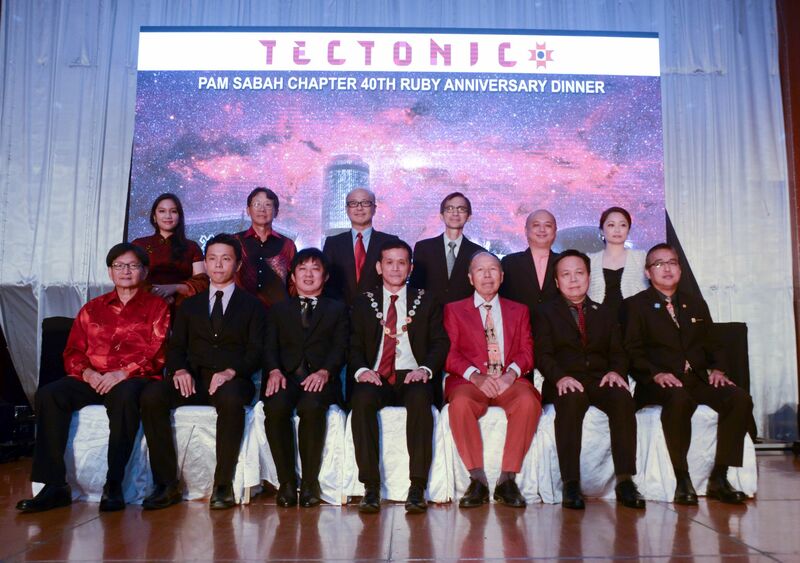 PAM Sabah chapter 40th Ruby Anniversary Dinner had been held at the Pacific Sutera Hotel Grand Ballroom, Kota Kinabalu on 5th June 2015. The dinner was successfully held with the “red” theme and “T”Tectonic. PAM President Ar. Mohd Zulhemlee An was presented as the Guest of Honor and witnessed the installation of the newly elected Sabah Chapter Chairman. Miss Earth Sabah 2010 May Salitah Naru Kiob was the MC for the night and former OIAM 3 contestant Ms. Esther Applunius had performed 5 delightful songs to all. The entertainment includes magic show performance by 19 years old magician from Malacca and the best dressed winner announcement.